Auto Collision: Don't Touch That Phone! - Harrison White, P.C. Home » Car Accident » Auto Collision: Don’t Touch That Phone! Auto Collision: Don’t Touch That Phone! Driving on a holiday weekend—or any weekend—can be an extremely dangerous activity. 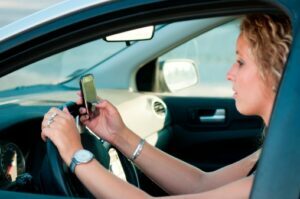 As I’ve written about in the past on my blog, distracted driving represents one of the most dangerous activities on the roadway today. As we have seen in the news recently, a truck driver involved in an auto collision in April 2015 was indicted by a grand jury for the collision that killed five Georgia nursing students. The driver was indicted on five counts of first degree homicide by vehicle, along with other charges. The driver of the truck admitted in court depositions that he was texting while driving. The nurses were from Georgia Southern University, in their first year of nursing school, traveling to a training session in Savannah. Click here to read the article. This collision is one example of the many collisions that have occurred recently as a result of texting while driving. Our firm has handled many cases on behalf of families and injured individuals who have suffered at the hands of vehicles driven by operators who were texting and driving. Texting and driving, in addition to driving under the influence of alcohol or distracted driving, are major causes of collision and fatalities on our roadways. Please make sure to put the phone down while you are driving. If you are driving this weekend, don’t drink and drive. These simple tips can avoid a tragedy similar to the one that happened in Georgia earlier in the spring of last year. If you or any of your family members are injured in an automobile collision due to a driver that is texting and driving a tractor trailer or automobile, or if you suffer any other type of injury, please contact us and we will be happy to evaluate your case. « To Talk or Not To Talk: That is the Question.